East Grinstead is a strange old place. Sitting on the border of Kent and Sussex it has been home to many famous people, drawn to the town by the peace and quiet, the sweeping South Downs and the country pubs with roaring fires. Winston Churchill retired here, purchasing the impressive gaff Chartwell, Winnie-The-Pooh set up his pad in the nearby Ashdown Forest and talking of joke characters, Peter André lived here too. But what draws such strange people to the area like Plastic Peter, or the ridiculous Right Said Fred (currently singing weekly at Saracens Rugby Club with their version of “Stand Up for the Champions”)? Some suggest it is not for the slice of Daily Mail inspired middle England, but because of Ley Lines. Ley Lines are alleged alignments of a number of places of geographical and historical interest, such as ancient monuments and megaliths, natural ridge-tops and water-fords. So is this the explanation for the presence in the town of organisations such as The Mormons, The Church Of Scientology, The New Life Church as well as your regular old religious denominations. So why congregate on East Grinstead? The Scientologists arrived when founder L Ron Hubbard bought a big old pad in the town back in 1959 and since has welcomed celebrity followers such as Tom Cruise, John Travolta, Katie Holmes, Kirstie Alley and, er Peaches Geldof to their mansion on the outskirts of the town. Tom and Katie love a trip down to the Co-Op when they are in the shack, whilst John can park his Jumbo at Gatwick nearby. With so many celebs wandering around town how could there be room for a football team? Last time I saw Tom Cruise at a game it was watching David Beckham playing in the Bernabau. So where does he get his fix of “soccer” in this part of East Sussex? East Grinstead Town obviously. 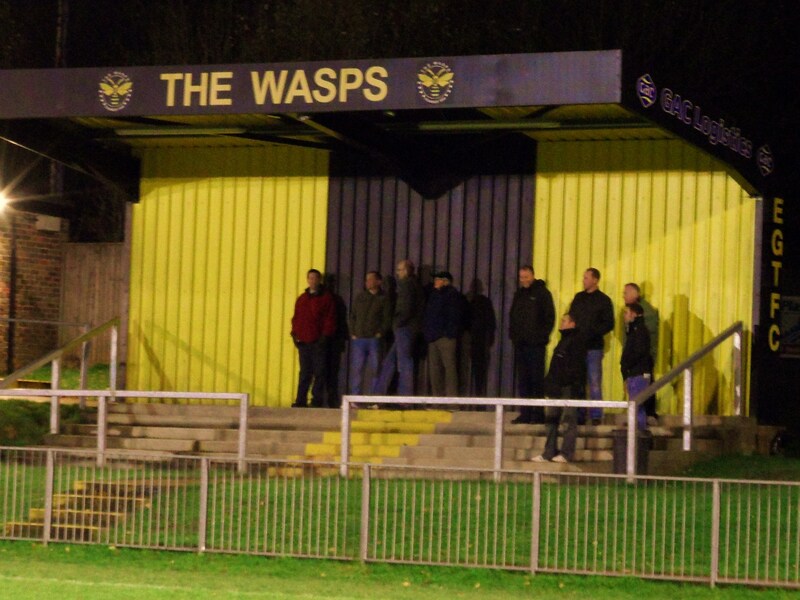 The Wasps were formed back in 1890 and have probably seen a fair few Mormons and Scientologists tucking into a cup of tea and a burger in the GEC Stadium over the years. The Sussex League team have floated along without causing too much of a kerfuffle in the town during the last 120 years unlike the various religious sects and their moment of glory came one hundred years ago when they reached the final of the Sussex Senior Cup, losing to those legendary St Leonards Amateurs in a snow storm. Ironically with winter weather threatening to take hold of South East England, I was watching the Wasps take on the Rooks in the same competition one hundred years later. Every year Lewes come into this competition with hope of at least an appearance in the final. With only two football league clubs in the county (Brighton and Crawley Town), and Eastbourne Borough playing at a higher level, with a prevailing wind and a favourable draw there is always hope that this season will be the one. Last season with the carrot of the final being the inaugural game at the Amex Stadium, Lewes drew Brighton in the quarter finals but couldn’t overturn an early Seagulls goal at the Pan and went out. So this season hope was again still flying when the Rooks beat Crawley Down in round two and were then drawn in the Third Round away at East Grinstead. A swift change from Director of Communications to a, well, Director of Communications that Superman would have been proud of saw me just getting into the GAC Stadium (aka East Court) just in time for the 7.15pm kick off. To say the ground is hard to find is a bit of an understatement. It is tucked away down a narrow lane that C S Lewis would have used for inspiration with no visible signs of life. However, the capacity car park suggested that this was a big game. Was cup fever in the air or were the Rooks going to suffer at the hands of a lower division side for the third time this season? 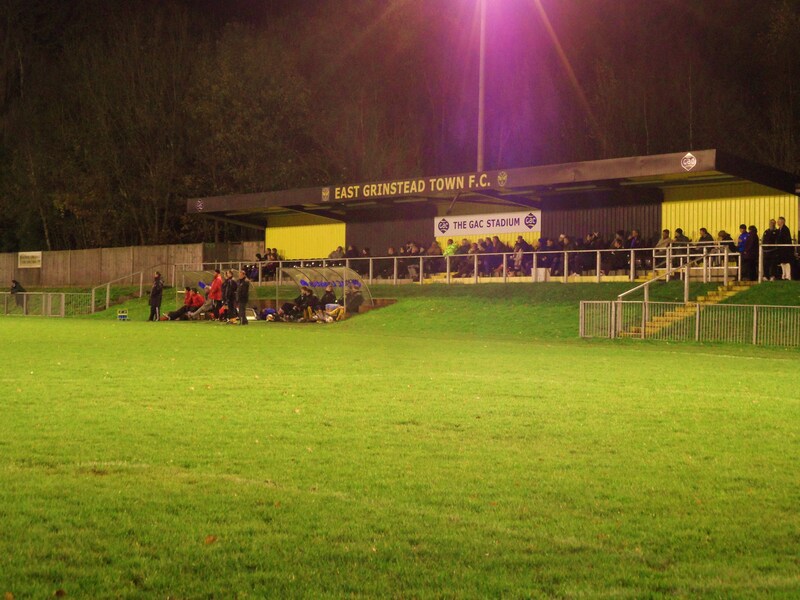 East Grinstead Town 0 Lewes 6 – The GAC Stadium – Tuesday 29th November 2011 In the end this went according to the script. Lewes scored six, could have had double that and towards the end the East Grinstead players starting looking at taking out their frustrations on the Rooks players on an ever-increasing muddy pitch. I had literally taken my place next to Big Deaksy and Dave (Trivia question of the day – name the English team who hold the record of 27 consecutive European games where they have scored) when Ian Draycott cut in from the right and fired the ball home. Super snapper Boysie was still chatting to random tram lovers (He loves a tram does Boysie) so do not expect any pictures of that goal. Draycott only seems to score the difficult goals for Lewes, almost perfecting that “smash in from the edge of the box”. East Grinstead had an opportunity to draw level when Lewis Hamilton brought down a home player in the box. For a minute it seemed like that Hamilton would get a red card, which in this competition can prove a nightmare as the County FA’s issue bans in weeks rather than games. 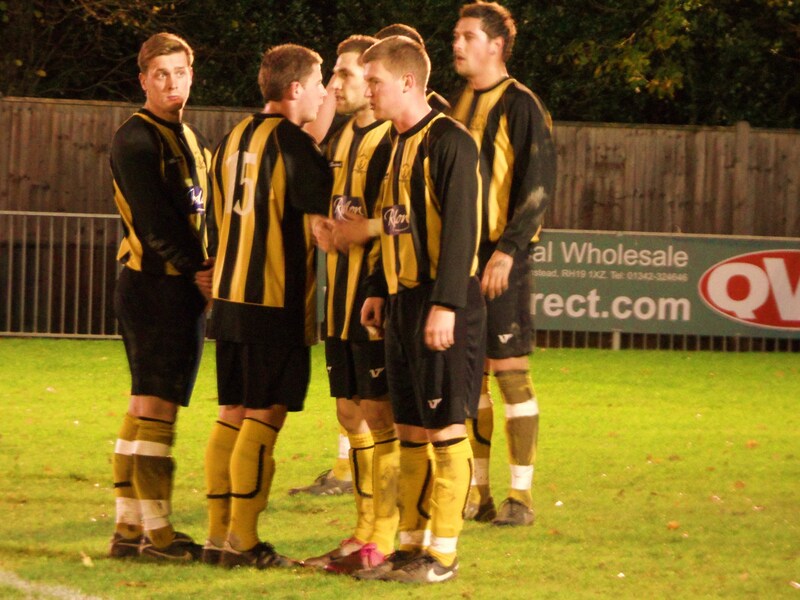 But in the Lewes goal was Stuart Robinson, returning to the team after a two month hiatus. Robinson is a big chap, in fact it seemed as if he had to duck to stand under the cross bar on his line, but he still got down very quickly and palmed the ball away. The home defence were living on borrowed time with last ditch clearances being the order of the evening. Finally a mistake was made and Paul Booth had the easiest of jobs to slot home. A swift retreat to the ample and welcoming club house saw a return to retro football. We all remember page 312 on Ceefax where the latest scores could be found. Today it is the red button on your TV for 21st century Ceefax to get the latest scores. Marvellous stuff. With the second half barely a few minutes old another defensive mix up saw Harry Harding take advantage and walk the ball into an empty net to essentially kill the tie. Three became four ten minutes later when Ciardini, obviously been studying the techniques of Ray “Tonka” Stewart, smashed home a penalty. Steve King, protected from the elements by his Russian Cossack hat brought on Christian Nanetti for the final twenty minutes and his twinkling toes soon had the home defence losing their cool. Number five came with ten minutes to go when Mickey Malcolm appeared to have taken one too many touches of the ball but somehow got a shot in that flew into the roof of the net. 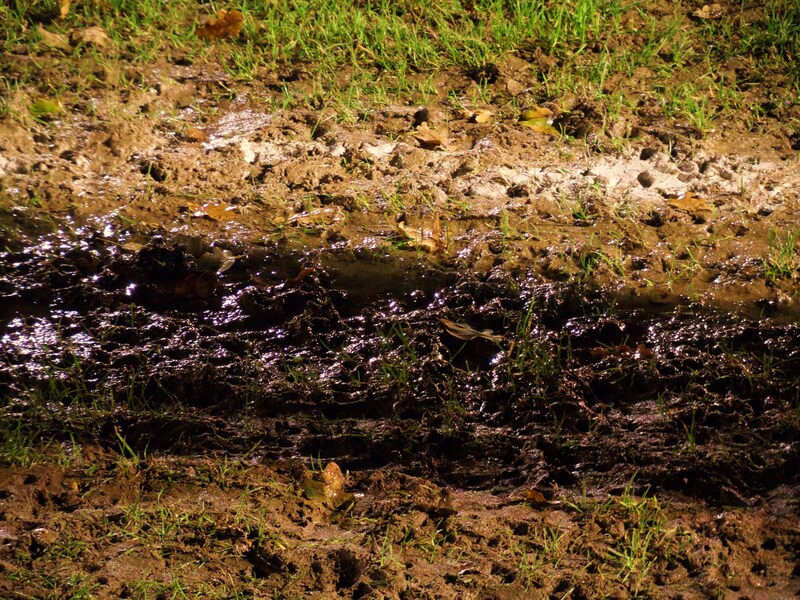 With that goal it was time to leave and try and dig my car out of the mud. As I walked along the side of the pitch a shout went up and Lewes had another penalty. Despite Nanetti snatching the ball, and Kamara pleading with the manager that he should take it, Ciardini retained his professionalism and took the kick, again powering it down the middle to make it six nil. Cup competitions often throw up shocks, especially if the bigger teams put out weakened teams. But this season the Sussex Senior Cup now has three teams in the quarter finals, all of whom who have overcome games against smaller teams, scoring an average of 6.5 goals in the process. The magic of the cup is still alive in East Sussex – perhaps those Ley Lines were magical after all.